"I am not worried, I know my body. It happens, it's football ... I am fine because I know I will come back in one or two weeks," Ronaldo said of the injury after Monday's 1-1 draw. It was only Ronaldo's second appearance for the national team since the World Cup last summer in Russia. The former Real Madrid talisman and five-time Champions League winner later made a high-profile switch to Italian giants Juventus. "I would have liked to have been at [Portugal's] other games. It has been eight months because I needed time for myself. It was a big move in my life, I switched clubs, for my family and children too, I needed to time to adapt," Ronaldo said. "I missed the national team, but sometimes we have to think in ourselves and it was the best decision." 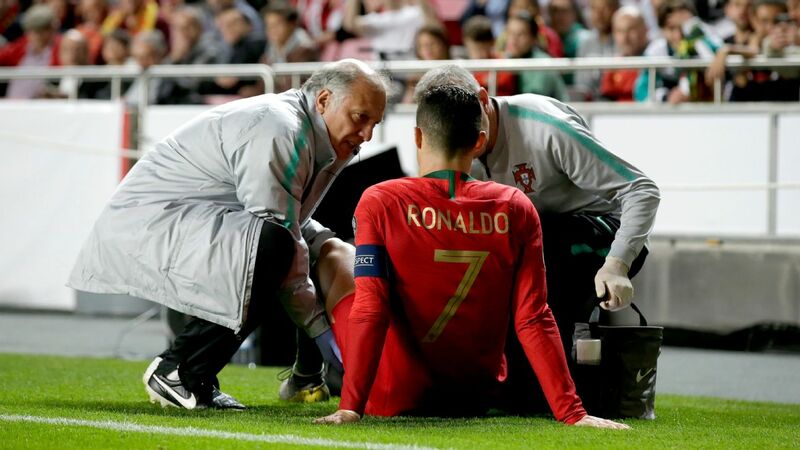 Juventus said in a statement on Tuesday: "After having to leave the pitch on 30 minutes during the Euro 2020 qualifying match between Portugal and Serbia, Cristiano Ronaldo underwent examinations in Portugal which showed a minor injury to his right thigh. "His condition will continue to be monitored and he will undergo further tests to determine how long until he can return to action." The Bianconeri are back in Serie A action on Saturday against Empoli, and will take on Ajax on April 10 in the first leg of the Champions League quarterfinals.